Why eat more fruits and veggies? • Color and texture. Fruits and veggies add color, texture, and appeal to your plate. • Convenience. Fruits and vegetables are nutritious in any form - fresh, frozen, canned, dried and 100% juice, so they're ready when you are! • Fiber. Fruits and veggies provide fiber that helps fill you up and keeps your digestive system happy. • Low in calories. Fruits and veggies are naturally low in calories. • May reduce disease risk. 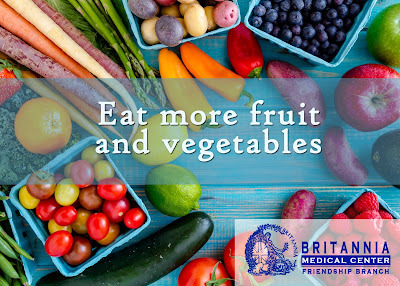 Eating plenty of fruits and veggies may help reduce the risk of many diseases, including heart disease, high blood pressure, and some cancer. • Vitamins and minerals. Fruits and veggies are rich in vitamins and minerals that help you feel healthy and energized. • Variety. Fruits and veggies are available in an almost infinite variety. There's always something new to try. • Quick, natural snack. Fruits and veggies are nature's treat and easy to grab for a snack. • FRUITS AND VEGGIES ARE NUTRITIOUS AND DELICIOUS! Fil-Am Friendship Hi-way, Angeles City.